As Amazon and Apple hit the $1 trillion valuation mark, there has been some speculation as to which company will be next. Despite reaching a market cap of $1 trillion, Apple and Amazon are very different in terms of CEO ownership stakes. Apple’s Tim Cook owns less than 1% of Apple stock, whereas Jeffrey Bezos of Amazon has 16.3% ownership stake. The amount of ownership stake a CEO has can possibly provide insight into specific goals and directions that a company is heading. For example, different ownership stakes for the CEO may alter the compensation make-up. 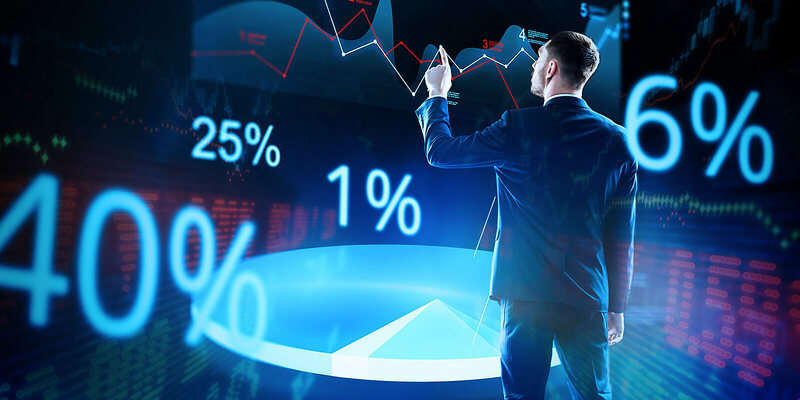 A CEO with lower ownership percentage may have compensation hinge more on non-stock-related performance metrics, while those with higher ownership may have compensation more tied to total shareholder return (TSR) and stock price. Among notable companies in the running to hit the $1 trillion valuation mark include Exxon Mobile Corporation, Microsoft, Alphabet and Facebook. Of the multiple companies approaching $1 trillion in valuation, only a couple of CEOs have more than 1% ownership. Expanding the scope to an entire index of companies, more than half—52.6%–of Russell 3000 CEOs have less than 1% stock ownership of their company and 33.0% of Russell 3000 CEOs have between 1% and 5% ownership. While the vast majority of Russell 3000 CEOs have less than 5% ownership, 3.6% of Russell 3000 CEOs own more than 25% of company shares. For example, the CEO of Dell Technologies, Michael Dell, owns 45.4% of company shares. Likewise, the CEO of Genesis Healthcare, Inc., George Hager, owns a large percentage of company shares, at 87.5% of all shares. Analyzing the Russell 3000 on different metrics allows for more insight into ownership. For example, 26.1% of Russell 3000 CEOs from companies with less than $100 million in market cap own over 25% of company stock. Often times, smaller market cap companies have a CEO who also doubles as the founder of the company. As a result, the individual typically will hold more ownership stake in the company. For example, ACM Research, Inc.’s CEO David Wang is also the founder of the company. His company has a market cap of $80.5 million, and he holds 26.15% ownership. On the flip side, higher market cap companies generally have fewer CEOs who are also founders of the company due to longer company history among other things. 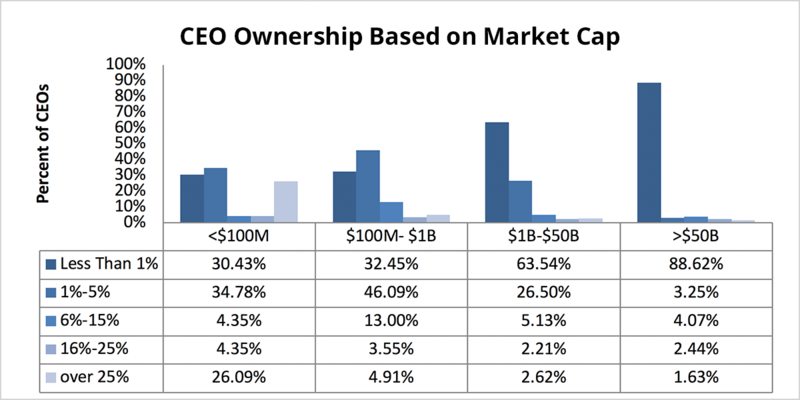 As a result, as the market cap increases, the number of CEOs with ownership greater than 1% decreases as well. Another way to analyze ownership is to look at the total shareholder return of companies with high CEO ownership percentage to that of low-ownership companies. For companies in the Russell 3000, the highest median three-year TSR of 11.71 comes from companies with CEOs who have between 6% and 15% ownership. 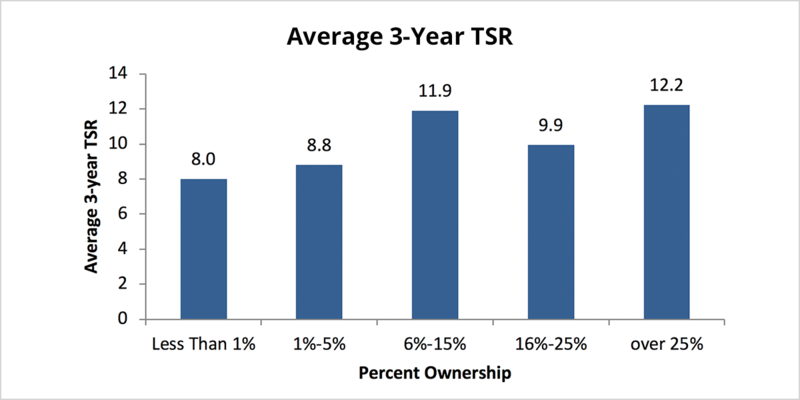 Companies with higher average three-year TSR have CEOs who have more than 6% ownership. The average three- year TSR for companies with CEOs who have 6%-15%, 16%-25%, and over 25% ownership is 11.90, 9.93, and 12.23, respectively. Typically, CEOs with more ownership stake have more incentive to increase the company’s stocks and TSR because the CEO’s payout is more dependent on this. In that same vein, it might make sense for companies with higher CEO ownership to base the chief executive’s compensation on TSR as a performance metric to provide incentive. Perhaps not surprisingly, the highest median CEO pay ratio for Russell 3000 companies comes from companies with CEOs that have less than 1% ownership. This is due to the nature of compensation at higher ownership companies. For companies, with low CEO pay ratios, the CEO has more ownership so they are less incentivized by cash compensation and more incentivized by stock prices to ensure that their stakes in the company are doing well. As an example, Berkshire Hathaway Inc. CEO Warren Buffet has 25.06% ownership in the company but received a total annual compensation of $100,000 in fiscal year 2017. As a result of his relatively low nominal compensation, the CEO pay ratio at Berkshire Hathaway Inc. is 1.87. 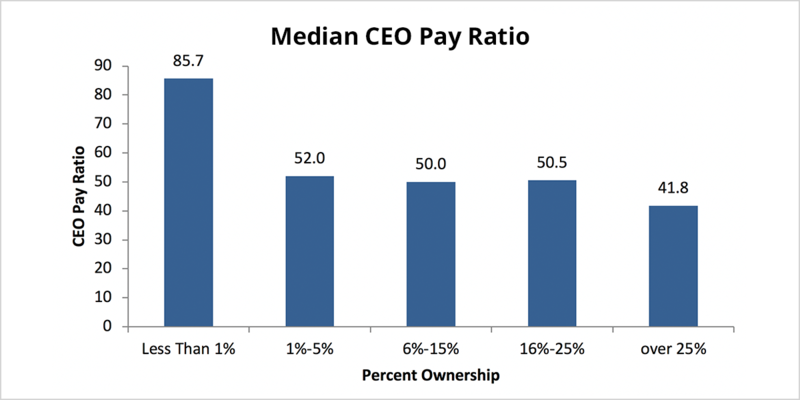 While the median CEO pay ratio for CEOs with less than 1% ownership is 85.66:1, CEOs with between 1% and 25% ownership have a median CEO pay ratio range between 41.75:1 and 52.00:1. For example, both Walmart and McDonalds have CEOs who have less than 1 % ownership, and have sizable CEO pay ratios of 1,188:1 and 3,101:1, respectively. 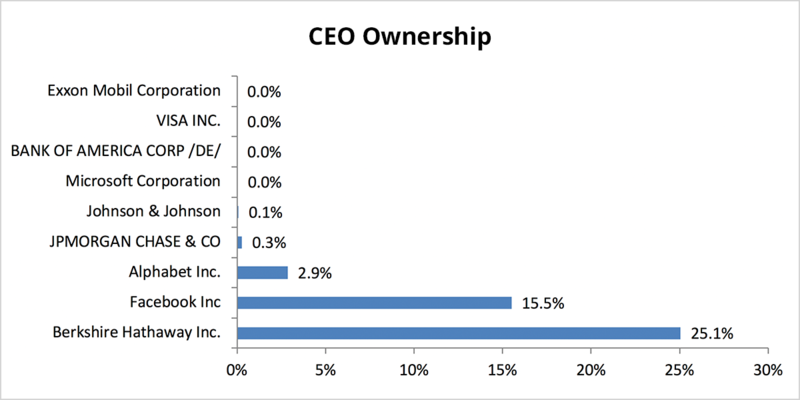 Overall, the percentage of ownership the CEO has may indicate how a company operates and exists in its space. For example, companies with a higher average three-year TSR and a lower CEO pay ratio have CEOs who own over 6% of their company. With more of an ownership stake in the company, the CEO may have more incentive to make sure the company’s TSR remains high because the CEO’s direct payout is based on how well the company is doing. Additionally, 88.62% of companies with a market cap greater than $50 billion have CEOs with less than 1% ownership. As a result, the safe bet would be that the CEO of the next company to hit the $1 trillion market cap will most likely have less than 1% ownership. 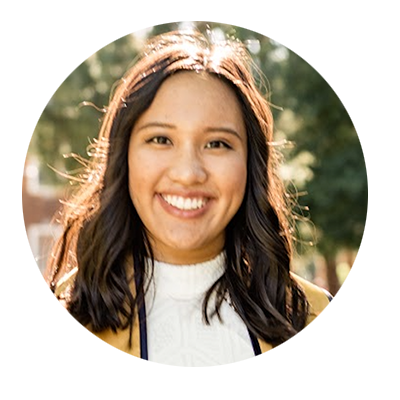 Jessica Phan, Senior Research Analyst at Equilar, authored this post. 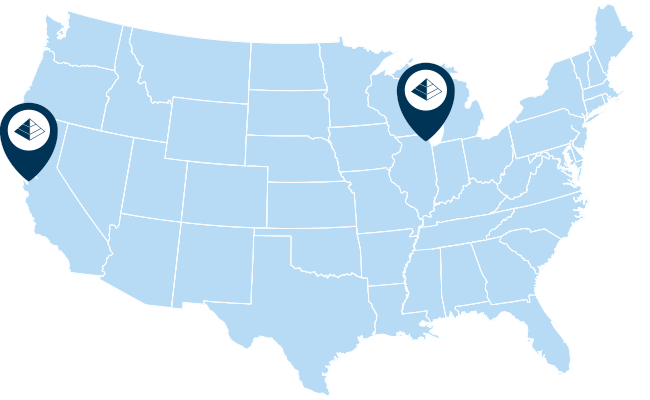 Please contact Amit Batish at abatish@equilar.com for more information on Equilar research and data analysis.